A luxurious haven of beachside glamour for jet-setters, VIPs and celebrities to wine, dine and lounge. Nikki Beach Ibiza brings the global concept by entrepreneur Jack Penrod to the stunning beachfront property right outside Santa Eulalia. The luxury beach club blends music, fine cuisine, entertainment, fashion, film and art. With beach clubs all over the world since 1998, Nikki Beach opened its Ibiza location in 2013. Since then it has become a hub for all things glam. This venue celebrates the pleasures of life, what is commonly referred to as the 'Nikki Beach lifestyle', and can be enjoyed in multiple ways. You can sip on a signature cocktail, relish a bottle of champagne or delight in their deluxe international menu featuring classic dishes from Nikki Beach's exotic locations. These can be enjoyed around their octagon bar, on the fab restaurant terrace or on their chic white sunbeds and teepees around the pool deck overlooking the bay of Santa Eulalia. Nikki Beach Ibiza also puts on a series of parties throughout the season with international DJs, live performers and dancers, a lavish twist on poolside partying. Arriving on a yacht? No problem, a complimentary Zodiac service will shuttle you to and from your boat. 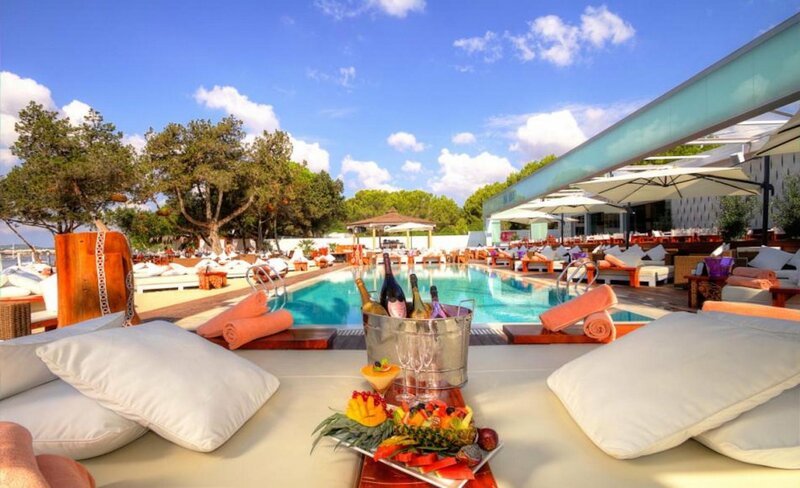 Nikki Beach Ibiza caters to the jet setting crowd, VIPs and celebrities. From midday to midnight from end of April till the end of September wine, dine, lounge and party at this deluxe beach club. Nikki Beach Ibiza -White Party 2017 from Ibiza Spotlight on Vimeo.